A recent visitor to New Zealand, a scientist from Israel, informed us of developments with phosphatidylserine which is a phospholipid found in soybean, egg and buttermilk. Whilst phosphatidylcholine has been well researched since it is a key component of lecithin, its sister molecule has not. Researchers have now found that phosphatidylserine has significant effects on preventing cognitive decline. The Enzymotec product is non-GMO and is derived from vegan sources with a recommended daily dose of 100 mg. This reviewer because of advancing age is keen to run his own clinical trial. Enzymotec is a dynamic biotech company and a leading global supplier of lipid-based products and solutions. They develop, manufacture and market innovative biofunctional ingredients and final products based on sophisticated proprietary technologies. A study carried out by the Lipid Unit of the Barcelona Hospital Clinic suggests that high consumption of olive oil, along with other foods rich in antioxidant polyphenols, may improve cognitive function and prevent neurodegenerative diseases. Polyphenols are known to be powerful antioxidants which may help to reverse oxidative damage that occurs in the aging process. This damage is thought to be a causative factor for the development of many lifestyle diseases including, heart disease, Type 2 Diabetes and Alzheimer’s disease. According to Dr. Emili Ros, one of the authors of the study recently published in The Journal of Alzheimer’s Disease, it is recommended to use olive oil on a daily basis, consumption of nuts four to seven days per week, and thankfully, drinking 2 glasses of red wine daily for men and one for women. Brain oxidative processes play a major role in age-related cognitive decline, thus consumption of antioxidant-rich foods might help preserve cognition. The aim of this recent reported literature was to assess whether consumption of antioxidant-rich foods in the Mediterranean diet relates to cognitive function in the elderly. In asymptomatic subjects at high cardiovascular risk (n = 447; 52% women; age 55-80 years) enrolled in the PREDIMED study, a primary prevention dietary-intervention trial, they assessed food intake and cardiovascular risk profile, determined apolipoprotein E genotype, and used neuropsychological tests to evaluate cognitive function. They also measured urinary polyphenols as an objective biomarker of intake. Associations between energy-adjusted food consumption, urinary polyphenols, and cognitive scores were assessed. Consumption of some foods was independently related to better cognitive function. Urinary polyphenols were associated with better scores in immediate verbal memory Increased consumption of antioxidant-rich foods in general and of polyphenols in particular is associated with better cognitive performance in elderly subjects at high cardiovascular risk. The results reinforce the notion that Mediterranean diet components might counteract age-related cognitive decline. This style of eating, which falls in line with the Mediterranean Diet pattern, appears to have positive effects not only on brain function but also cardiovascular health. The study was carried out as part of the multicenter clinical trial PREDIMED, a long-term nutritional intervention study aimed to assess the effects of the Mediterranean diet in the primary prevention of cardiovascular diseases. The trial involved over 7,000 subjects, aged between 55 and 80, at high risk of cardiovascular disease. 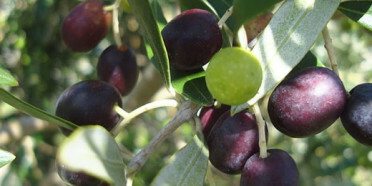 Extracts from the olive fruit are now being marketed as food grade antioxidants. One product from Spain is called hytolive and contains more than 35% hydroxytyrosol. It can be used in dietary supplements, functional foods, beverages and cosmetics. Salkat are the agents in New Zealand. Another patented product is Hidrox. HIDROX® has a unique profile because of the processing of its olives. The olives that create HIDROX® are harvested early in the season and are green resulting in a golden brown juice. The juice is freeze dried creating the trademark golden color of HIDROX®. Harvesting the olives early in the season is essential to the unique power of HIDROX® for it is early in the season that olives are enriched in oleuropein which then becomes Hydroxytyrosol. Additionally hydroxytyrosol is an amphiphilic molecule meaning that it’s both fat and water soluble making it the ideal substance for use in foods, beverages, cosmetics, animal feed, dietary supplements etc. Funded under the USDA’s Technical Assistance for Specialty Crops (TASC) grant, some recent research is the second phase of an earlier study and part of an ongoing initiative to establish the chemical profiles of domestic olive oils, in order to evaluate and fine-tune U.S. standards and prevent trade restrictions for American olive oil exporters. The technical standards for olive oil established by the International Olive Council (IOC) are based on the chemical profiles of European and North African olive oils. The unique chemical characteristics of New World olive oils can exceed certain limits in the international standards, causing a downgrade and closing off potential markets to American producers. Ninety percent of the global olive oil consumption is beyond American shores. In this study, which was designed by UC Davis Olive Center Research Director Selina Wang. Specifically, testing was carried out by the UC Davis Olive Center, the Blakely Laboratory, the Australian Oils Research Laboratory (AORL) and the COOC taste panel. Ten of the samples (around 17 percent) were found to have sensory defects and would therefore not be considered to be extra virgin on that basis alone. All 60 samples passed the test for free fatty acids (FFA) with levels below the 0.8 percent limit in both the USDA and IOC standards. Note that China also is taking a long hard look at imported Italian olive oils the majority of which are now suspected to be fraudulent. Chinese consumers have been repeatedly impacted by food safety events over the past few years. Recently, recycled cooking oil has emerged as a food safety issue that challenges government authorities and consumers alike. Recycled cooking oil, or “gutter oil,” is refined from kitchen waste, gutters, drains, and animal fat, as well as oil that has been repeatedly used to fry foods. By using a series of simple processes that include collection, preliminary filtration and boiling, refining, and the removal of adulterants, illegal gutter oil can be cleaned up enough to meet the sanitation standards of cooking oil and sold to low-end restaurants and small canteens. As a result, low-income people are major consumers of recycled cooking oil. Although contamination with pathogenic microorganisms is not likely to be a problem in such recycled cooking oil, significant levels of toxic substances that remain in the oil, such as aflatoxins, polycyclic aromatic hydrocarbons, and 4-hydroxy-trans-2-nonenal (HNE), among others, might be harmful and could even cause cancers. So, the reuse of the gutter oil has caused great concern. Why does recycled cooking oil make it back to the table? Significant profits are the major reason. Since the price of edible oils surged three years ago, a processor can easily sell one short ton of recycled cooking oil at half the price of fresh oil at a huge profit. For example, waste cooking oil can be purchased for about 3,000 renminbi (RMB), or $470 per ton. After a preliminary extraction, including deodorization, dehydration, and decolorization, the raw oil can then be re-sold at a price of 5,000 RMB per ton, while the retail market price of the end product is about 8,000–10,000 RMB per ton. Such huge profits lure greedy people to take part in this illegal practice, making it difficult to manage and control. Inadequate inspection, difficulties in identifying recycled cooking oil, and consumer habits, such as over-ordering at restaurants to show respect to guests, might also contribute to this phenomenon. The Chinese government is taking several steps to address these problems and eliminate recycled cooking oil from people’s dining tables. It has launched a plan to cut off the source of the recycled cooking oil by uniformly collecting kitchen waste and gutter oil. Harsh punishments have been introduced in an effort to deter unscrupulous traders and manufacturers. Restaurants that are found to purchase and use the harmful oils will be immediately shut down and subjected to heavy fines in accordance with the Food Safety Law of China. Having read the reports about this scandal in the press, this author was understandably apprehensive during his recent visit to Shanghai. However there was nothing to fear and as usual the food was original (baby turtles), interesting and extremely tasty even though there was some desperation in getting a big bowl of bran on returning to NZ. Proof that good cholesterol can fight coronary disease and save lives came in a recent report of medical intervention. One patient persuaded John Kastelein to explore the radical idea that would anchor his future career. This was that LDL should be eliminated from the patient’s body and HDL increased.The patient still lived seven years later.Drug companies are now working on synthesing HDL to administer to Heart attack patients. This is planned for August 29th this year and the programme is still being finessed. Details will appear on the website as will details of the AGM.